On Charlie Rose Wednesday night on PBS, guest host (and CBS anchor) Jeff Glor interviewed journalist Jacob Weisberg, who is Editor-in-Chief and contributor to the Slate Group, (which publishes Slate Magazine), on his new book about Ronald Reagan. At mid-interview, Glor asked Weisberg what Ronald Reagan would think about the current GOP party, giving the liberal journalist plenty of time to bash the presidential candidates and paint Reagan as liberal on immigration, abortion and “tolerance" in the GOP. Former President George W. Bush has kept a low profile in his years after office, preferring to focus on personal reflection and veterans' causes since leaving the presidency in 2009. But that didn't keep a left-wing panel on MSNBC from using Bush's recent bike ride with wounded veterans to blast his presidency, though. In what appears to be a daily theme on MSNBC, the liberal network seems to find new ways to smear the Republican Party. The latest example from the liberal network was on the March 5 Now w/ Alex Wagner on March 5, when the all-liberal panel took to smearing Attorney General Ken Cuccinelli (R-Va.) on his bid to be the next Governor of the Commonwealth. During Thursday's 12 p.m. ET hour on MSNBC, host Contessa Brewer, who is soon to be leaving the anchor chair, declared that moderate Republican presidential candidate Jon Huntsman was "trying to turn things around with a new take-no-prisoners strategy, calling out his conservative competitors for their far-right views." Brewer talked to Jacob Weisberg, editor-in-chief of the liberal Slate magazine, who wrote a fawning profile of Huntsman for Vogue magazine. She wondered: "Is Jon Huntsman sort of an anti-Republican?" Weisberg didn't agree with that description, but argued: "He's what used to be the mainstream of the party, he's the kind of Republican who could win a national election against Democrats....But for some reason, for various reasons, the Republican Party seems to have been taken over by the Tea Party movement, by these sort of patriotic anarchists." Can you say "bitter"? That's the vibe Slate.com Editor-in-Chief Jacob Weisberg gave off in an Oct. 17 column, which will appear in the Oct. 26 issue of Newsweek, about Fox News headlined "The O'Garbage Factor." Weisberg, who once diagnosed former President George W. Bush with a learning disability, contends the Fox News Channel goes beyond just making liberal media elitist like himself cringe - it's actually un-American. 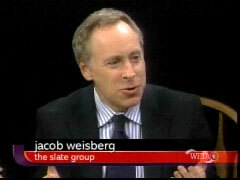 Weisberg alluded to the recent rift between the White House and the Fox News Channel. He contended, with an almost-overdone effort to be self-righteous and snarky, that the analysis of the feud, done on a recent broadcast of "The O'Reilly Factor," was all just too slanted for his tastes. He went along with the left-wing noise machine's notion that Bill O'Reilly, who isn't exactly a Reagan Republican, is some sort of tool of the right-wing. It's not preposterous to imagine laws that would try to save money by encouraging the inconvenient elderly to make an early exit. After all, that's been the Republican policy for years. Remember when the alarmists were taking the premise that anthropogenic global warming was more of a threat to the planet than just polar bears and penguins, but also sea levels and catastrophic weather patterns? Jacob Weisberg, the editor in chief of the Slate Group and author of "The Bush Tragedy," presents seven things taken for granted that might not be completely correct in a column for the April 13 issue of Newsweek. "A lot of premises have turned out to be wrong lately," Weisberg wrote. "I'm not talking about evanescent bits of conventional wisdom, but about overarching assumptions that were widely shared across the political spectrum." This year's annual staff survey matches the last two presidential contests when nearly every editor and reporter voted for Al Gore in 2000 and John Kerry in 2004 (2004 MRC CyberAlert item). Slate.com headlined an October 26, 2004 article: “At this magazine, it's Kerry by a landslide!” In 2000, 12 of the 13 in the top editorial positions voted for Gore, with the 13th going not for Bush but the libertarian. 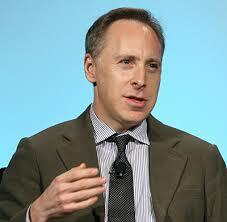 In all three years, the Democrat earned the vote of Slate's chief editor, Jacob Weisberg, a former Newsweek reporter. Jacob Weisberg of Slate.com, and a contributor at Newsweek, told David Schuster of MSNBC yesterday that President Reagan would be “rolling over in his grave” if he knew that Sarah Palin brought her unwed pregnant daughter on to the stage with the family at the Republican National Convention. I was shocked to see her unmarried pregnant teenage daughter on stage with the Republican nominee. It seemed to me that Ronald Reagan would be rolling over in his grave if he saw the Republicans embracing unwed motherhood this way. And I think, really, the issue there is about the pro-life absolutism that has come to dominate the party.